Shoot the Chutes first appeared in 1884, when J.P. Newburgh introduced the world’s first dedicated water ride on a hill in Rock Island, IL. Built on the side of a hill in Watch Tower Park, a 500 feet long greased wooden ramp had large flat bottom boats slide to the bottom and then skip across a large body of water. An employee would ride down with the boat and after it settled, would pole it back toward the ramp, where a steel cable would pull it back up. A turntable was even implanted at the top of some installations to help spin the boats toward the proper direction. It was a very popular attraction, but was eventually supplanted by more modern rides. In those times, parks had a very high attraction turnover and even rides that today would be classified as historically important were routinely torn down. A locally made old style Shoot the Chutes with an employee on board was discovered in Japan in 2004-2005, but has since been torn down sadly. A further evolution of that attraction dates back to the early 1900’s. Those rides consisted of a fleet of wooden flat bottom boats that floated alongside either a dark tunnel or scenery. 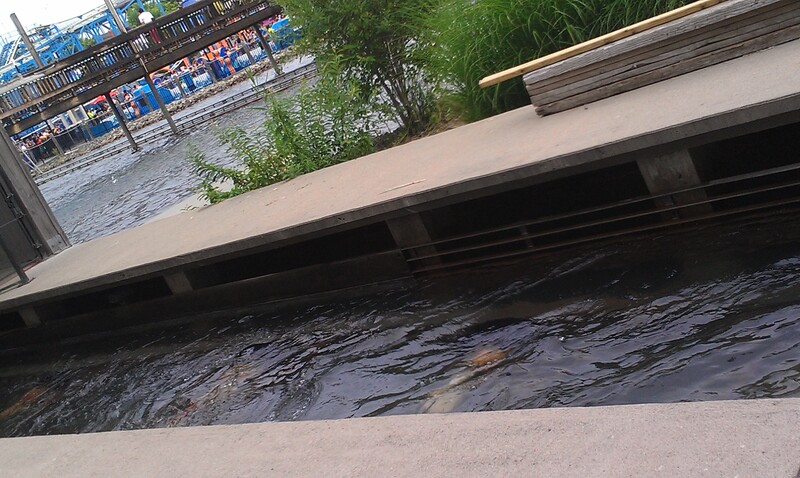 It then went up a wooden lift hill and then dived into the water down after sliding down a ramp. A few examples of remaining Old Mill/Mill chute in the world are the Mill Chute at Lake Winnepesaukah in Lakeview, GA, Garfield’s Nightmare at Kennywood (West Mifflin, PA) and River Caves at the Pleasure Beach in Blackpool, UK. The three pictures above show the Mill Chute at Lake Winnepesaukah. The lake is natural and it is the velocity from the drop that allows the boat to transition to the trough that leads back to the station. 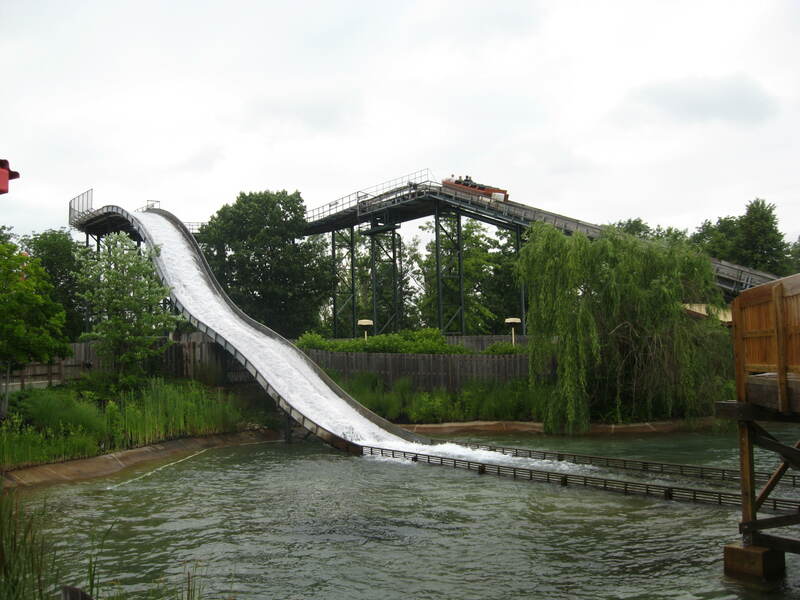 In 1985, Intamin introduced their take on the classic water ride by designing a modern version called the Spillwater. 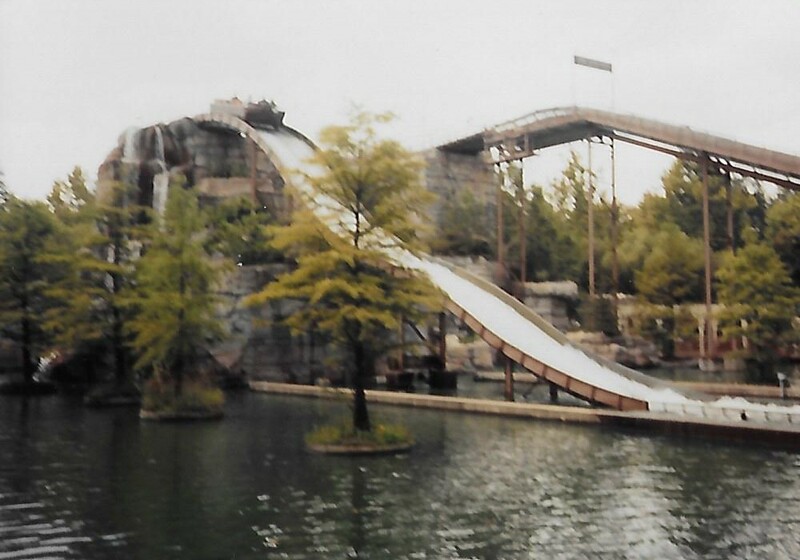 The first installation was the Diamond Falls at Kings Dominion (Doswell, VA) and it stood 50 feet tall. 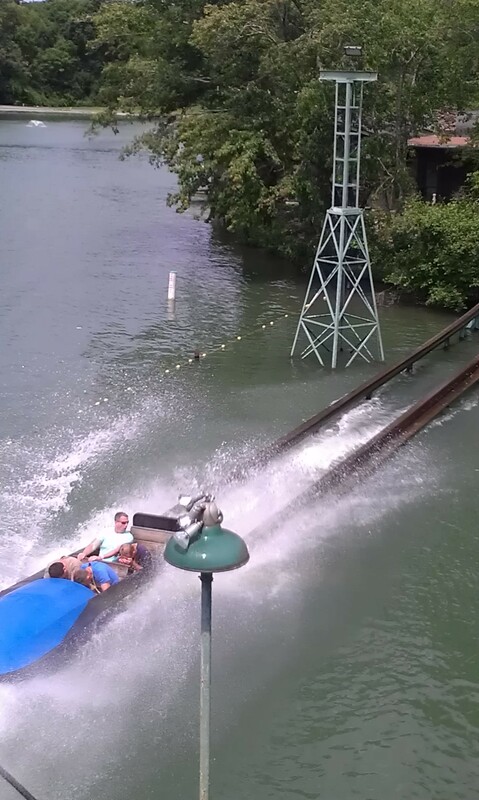 The ride consisted of a lift hill, an upper trough and then the drop down into the water. It would then float inside a show building to explore a diamond mine inhabited by a dragon. 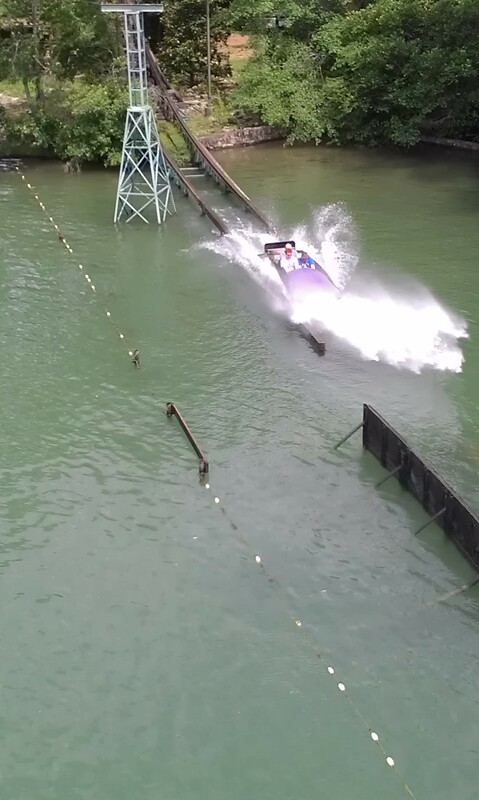 The last feature was a bridge that was constructed over the run out of the drop and this was to allow exiting riders to get soaked by the huge wave created by the boat when it hit the water. The lift hill used the same principle as the Intamin River Rapids: two parallel chains are attached to hardwood boards. The boat engages the lift hill and is taken up, but after a few months of use, there were concerns with the boards. 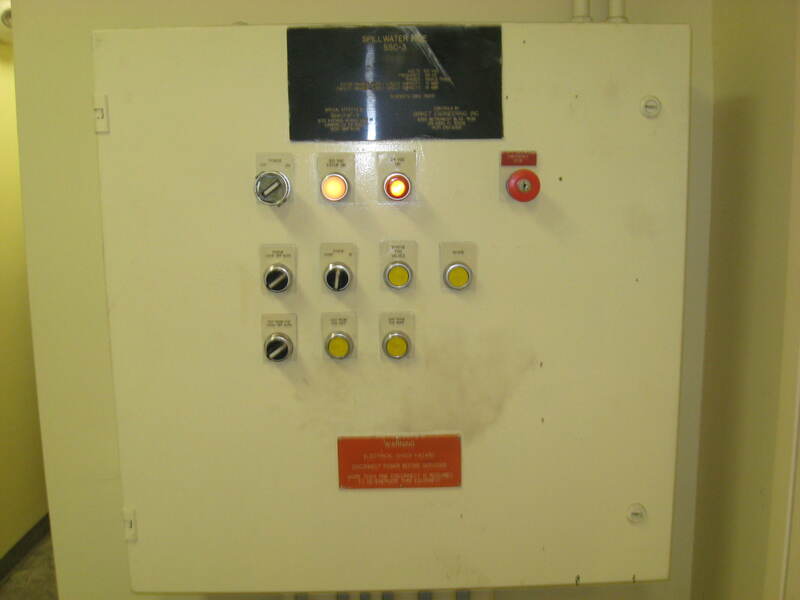 The boards themselves were not the issue, as the wood selected was very tolerant to water. It was more the fact that since the ride used water from the nearby Lake Charles, each boat bottom was covered in a layer of slime that made them slippery. So the solution was to add rubber grips to the lift 450 boards to improve traction. Remember what was said about the wood being tolerant to water? It was so resistant that traditional tools could not make a dent in it! Diamond bit drills and cement saws had to be used to modify the boards. The drop itself was not straight, but had a bump in the middle, creating a “double down” for additional thrills. The boats used were high capacity, with 5 rows of 4. Interestingly, even with the the double down and drop size, an active restraint was not required and riders have a large fixed padded lap bar to hold on to per row. Each boat has 4 large rubber wheels used when it is not floating and 4 smaller guide wheels. 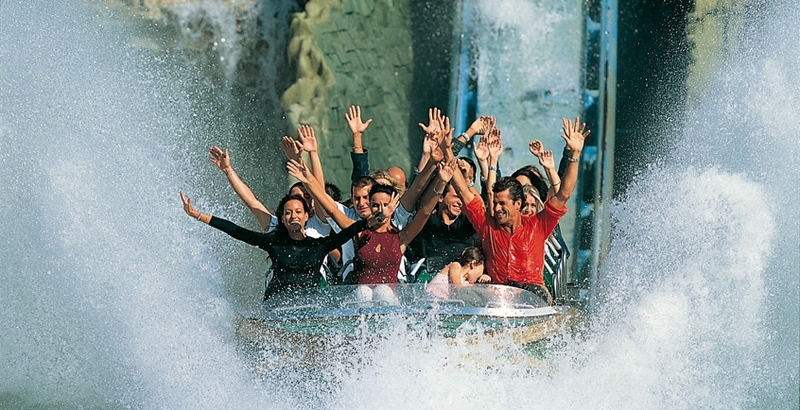 The front of the boat has a scoop shape and this is used to create the ride signature: a giant 20 to 30 feet tall wall of water that is visible from far. This also has the effect of completely soaking riders. The ride had many challenges, but they were overcome and the ride was a great success at the park. In 1987, the defunct park Opryland in Nashville, TN opened the Old Mill Scream. It was smaller and eliminated the building, but kept the double down on the drop, which was now 50 feet tall. This version was popular and sold a lot models. One interesting update was that the boats were redesigned. The lap bar was now fixed and this improved capacity a lot as well. This scanned picture shows the Old Mill Scream a few years before Opryland closed. It had a beautiful location above water in the park. This was originally the Amazon Falls at Kings Island, OH. It opened in 1988 and was renamed in 2000 to “Congo Falls”. You can see the double down on the drop in this picture. This is the exit path for Congo Falls. The ADA accessible ramp leads to the bridge and then goes down to the station. 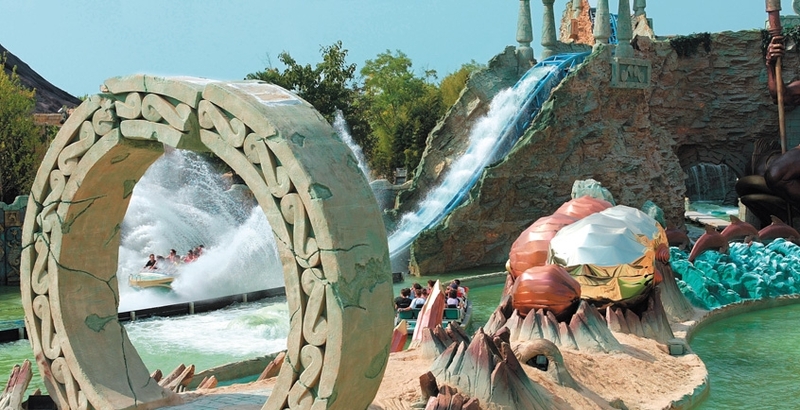 In 1989, Parc Asterix introduced the “Grand Splatch”. It was the first to move away from the oval layout with a taller lift hill. After the lift, a small drop leads into a slow float past gardens. It is a very long ride with a 2211 feet long course. Two “braking” sections along the way use submerged pusher wheels to space the ride 9 boats. A third braking section is located before the ride final 36 feet double down drop. In 1992, Phantasialand (Bruhl, Germany) opened the Hollywood Tour in the basement of the Space Center/Temple of the Night Hawk building. 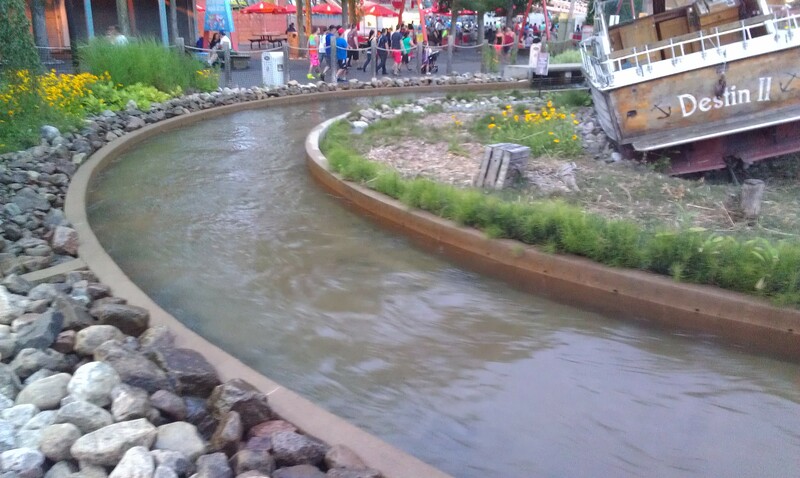 This dark ride used a modified Spillwater system that featured the first ever curved drop on a water ride. The ride left the station and dropped to the left in a steep ramp that ended with a splash in the water. 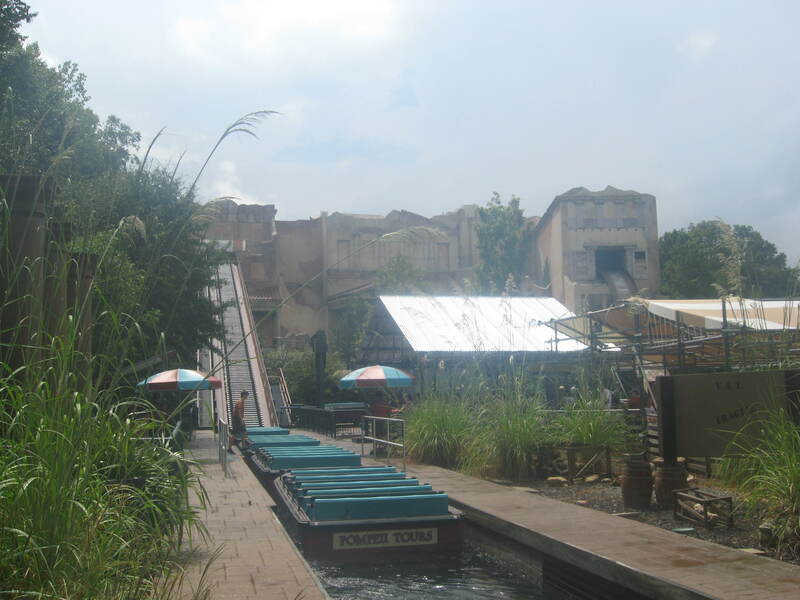 5 rows/20 passengers boats are used on this ride and the ride lone lift hill is at the end. 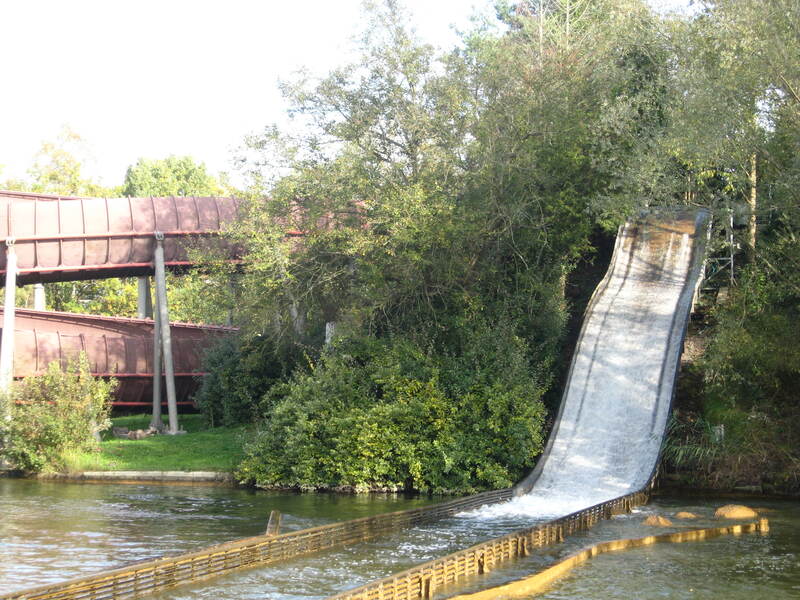 Also in 1992, Intamin provided two water rides to Walt Disney Imagineering for Disneyland Paris (Chessy, France). Both used similar 6 rows/24 passenger boats and while it’s a Small World has no drop and instead use pumps throughout the ride to push boats along. Pirates of the Caribbean has a tall chain lift hill at the start and is on 3 levels, with two drops to move boats along. Thus, it is similar to a shoot the chutes with the huge boats and drops. In 1995, Intamin was one of the supplier for Busch Gardens Williamsburg (Williamsburg, VA) “Escape from Pompeii” dark ride/shoot the chutes hybrid. 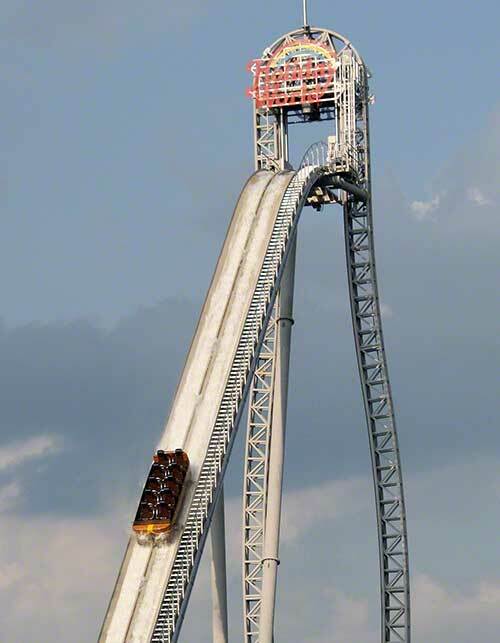 Intamin provided a Spillwater lift hill, 49 feet and a half tall drop and 5 boats. One modification to those that the park ordered were adjustable lap bars for each row. The ride to work properly has to run four boats and a spare is usually kept in the show building. Thus, the boats are rotated in and out throughout the season. The open air loading station and the ride show building in the background. 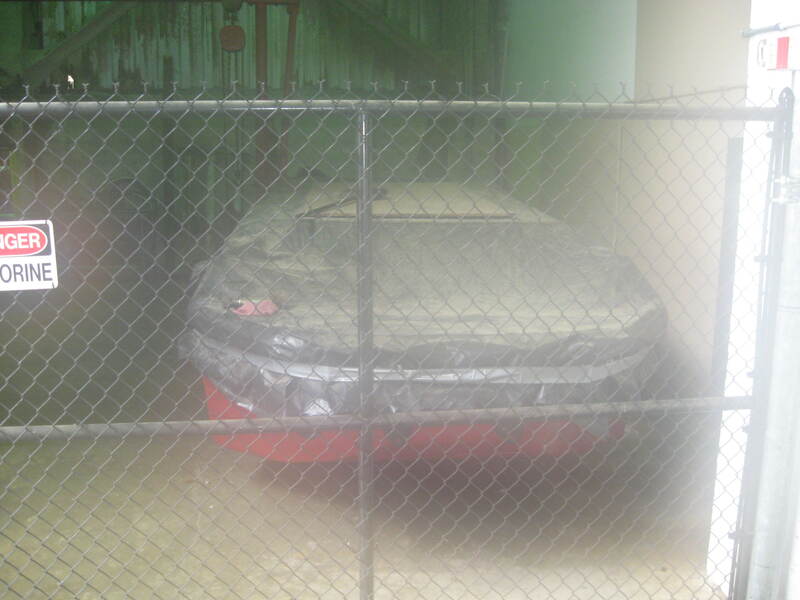 The spare boat stored under the show building. 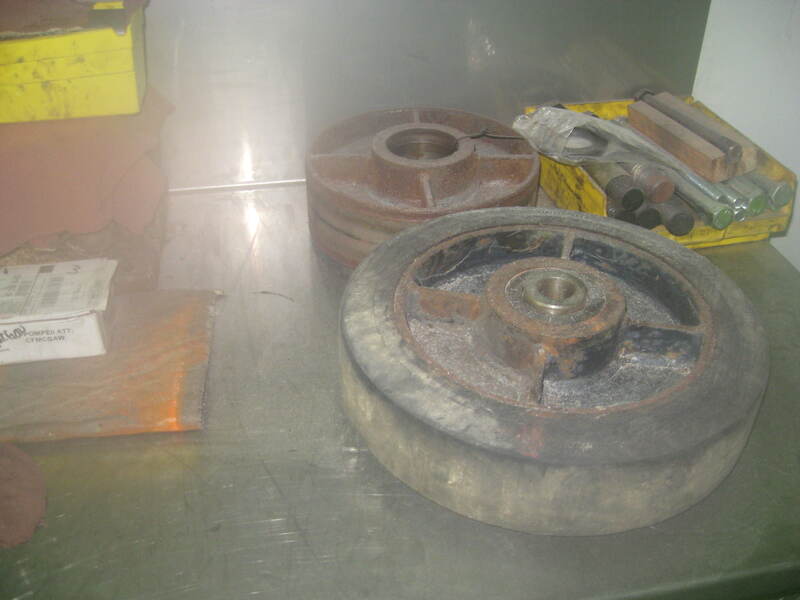 The road wheels used on the Intamin Spillwater boats. In 1996, when Warner Brothers transformed the old Traumland in Bottrop, Germany into Warner Brothers Movie World, Intamin was called to provide 4 new attractions. One was an indoor boat ride that is similar drop wise to the Hollywood Tour in Germany, a Dueling Roller Coaster, an indoor-outdoor river rapids and the Bermuda Triangle. Bermuda Triangle used an extended Intamin Spillwater with smaller 4 rows boats. The ride concluded with a straight 32 feet drop out of a volcano. The ride still operates today at the renamed Movie Park Germany. Intamin modified the standard oval model in 1997 when Iguazu opened at Isla Magica. Located in Sevilla, Spain, this new theme park opened as the replacement of the 1992 World Fair. It featured two Intamin water rides and one of them was Iguazu. The ride site is a beautiful hill and thus, it appears like the ride has always been there. The drop is 50 feet tall and is at a straight 45 degrees angle, eliminating the double down. This is a very popular style and is what every park after has ordered. 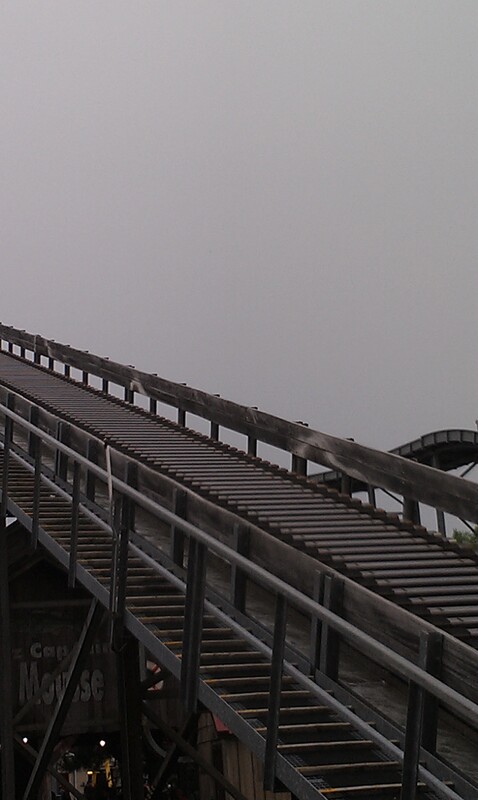 This is the traditional Intamin Spillwater/River Rapids lift hill with the wooden boards and double lift chains. Pusher tires are used in the station and blocking areas to stop and properly space the boats. The cement channel used to bring the boats back to the station after it leave the splash down lake. The boat here has just dropped down and is sending a wave toward the bridge. The four above pictures show the Splash at La Ronde (Montreal, QC). It is a 2004 Spillwater 20 with the straight drop. In 2000, Knott’s Berry Farm (Buena Park, CA) introduced Perilous Plunge, the world’s tallest and steepest water ride at the time. Sold as a Mega Splash by Intamin and standing 121 feet tall, it consisted of a Figure 8 layout to save space and the record breaking drop was 115 feet tall at a 75 degrees angle. Due to the steep lift angle and height, Intamin went to a roller coaster style chain lift rather than their traditional water ride lift. It had 3 boats that featured 6 rows of 4 and given the ride intense negative forces, the standard Shoot the Chutes restraint (or lack of) could obviously not be used. Intamin instead implanted the same restraints as on their Hyper Coaster line: individual T shaped lap bar and seat belt. Due to space restrictions, Intamin added an adjustable magnetic braking system to the ride run out area. This also allowed the park to control the splash depending on the forecasted weather. In September 2001, the ride was closed following a tragic accident. 4 point seat belts harnesses were retrofitted to each seat and the ride reopened in June 2002. This also unfortunately had the effect of destroying capacity. It would take 10-15 minutes to load and dispatch a boat! In 2007, the park ordered two new boats and those were equipped with Over the Shoulder restraints, solving the capacity issue. More technical issues ensued and in 2012, the park announced they would retire and scrap the ride in September 2012. 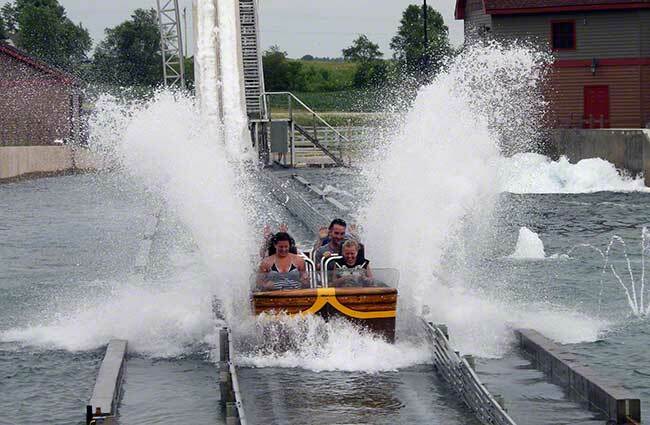 In 2002, Oakwood Theme Park in Pembrokeshire, UK opened Hydro, the second Mega Splash. Standing 100 feet tall, it had an oval layout and given the park size, was ordered with one boat, which was similar to Pilgrim’s Plunge original boat configuration. 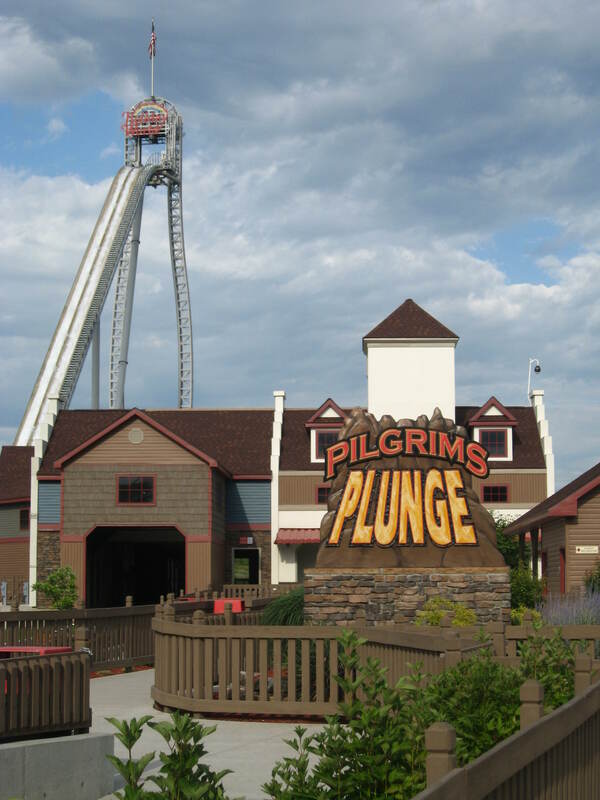 Unfortunately, there was another tragic accident on this ride and it was closed most of the 2004 season. 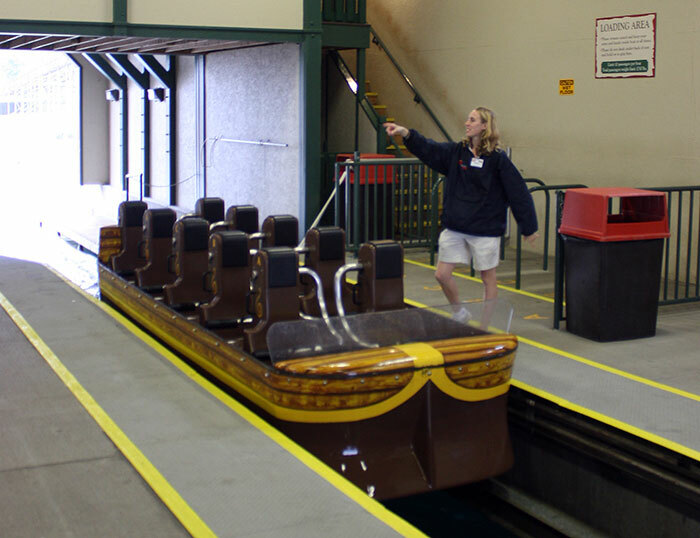 It was renamed to “Drenched” when it reopened in 2005 and the boat was retrofitted with Over the Shoulder Restraints. It still operates today. 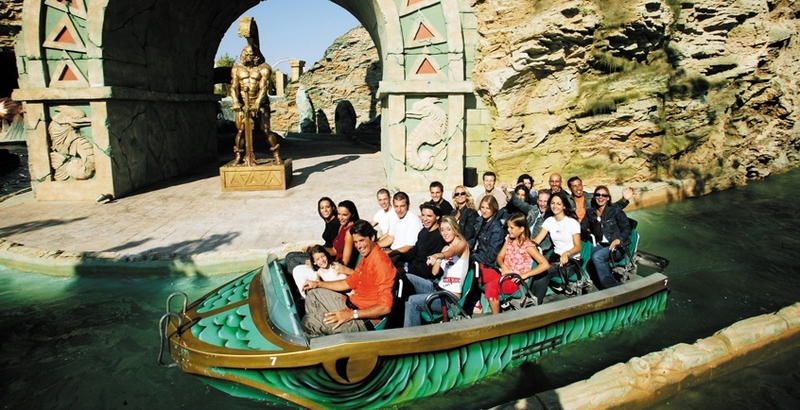 2003 saw Gardaland (Castelnuevo del Garda, Italy) introduce the world’s only Super Splash, Fuga de Atlantide. What is unusual here is that while it has two drops (33 and 48 feet) in an elaborate themed area, it use a lot of roller coaster technology. For example, the lifts use cable driven sled cars to take riders up roller coaster tracked lift hills. The boats stay on those tracks for the elevated sections, drops and run out and then it goes back to free floating. The boats sit high above the water and each of the boat 20 seats has an individual seat belt to restrain riders. The ride was built with very elaborate theming surrounding it. You can see the roller coaster track used for the elevated portions in the background. 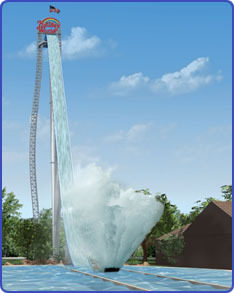 In 2009, Holiday World/Splashin’ Safari (Santa Claus, In) introduced a new type of shoot the chutes: the Hyper Splash. Featuring a 135 feet lift hill, it used a tilting double elevator to take the new generation 10 passengers boats up the record breaking hill. 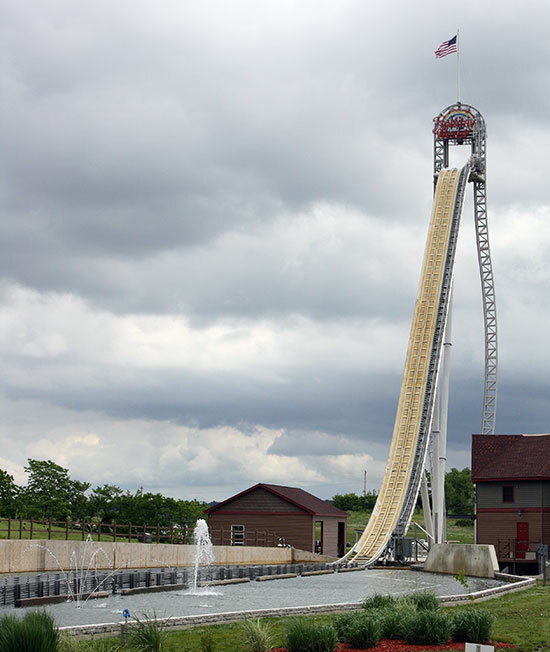 Then, the boat slide down 131 feet at a nearly constant 45 degrees reaching 50 mph. Interestingly, a 45 feet tall wall of water was mentioned in the press release when the boat would hit the water at the bottom. Instead, a tiny barely 15-20 feet tall splash was all that was generated. Guests in the front row of the boat would instead be splashed when the boat left the run out rails and dipped into the deep water of the trough. This concept art provided by Holiday World ( www.holidayworld.com ) show what the splash should have been. The boat going down the drop. The boats as mentioned were a completely new design. Featuring 5 rows of 2 passengers, riders sit high above the water and are secured with an overhead L shaped lap bar. Photo appears courtesy of www.negative-g.com . 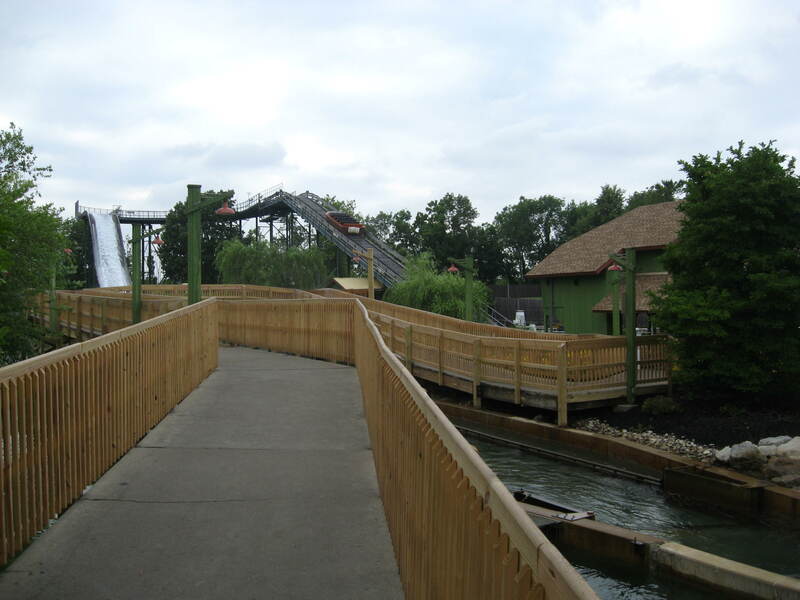 In 2010, Shoot The Rapids opened at Cedar Point (Sandusky, OH). It used the Hyper Splash boats, but replaced the tall elevator lift with two traditional lift hills. 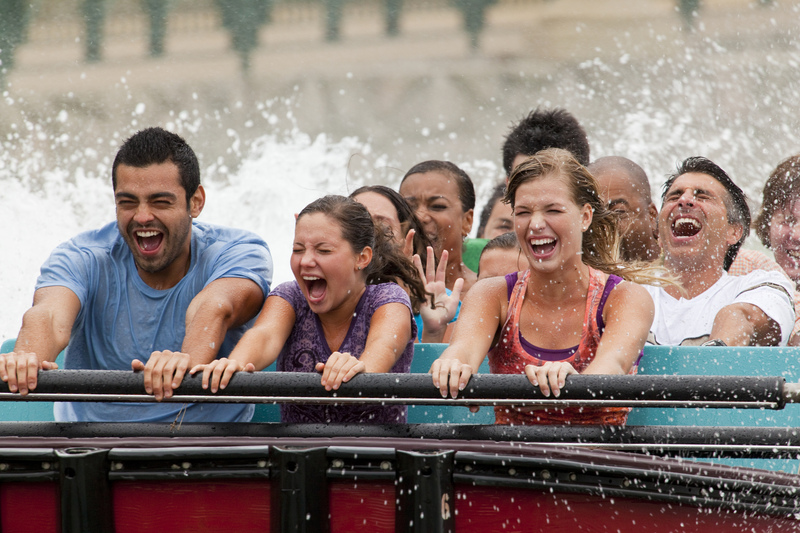 Strangely, it broke the traditional water ride rule: the largest drop is the last one. The first hill on Shoot The Rapids is 85 feet tall and the second one 49 feet tall. 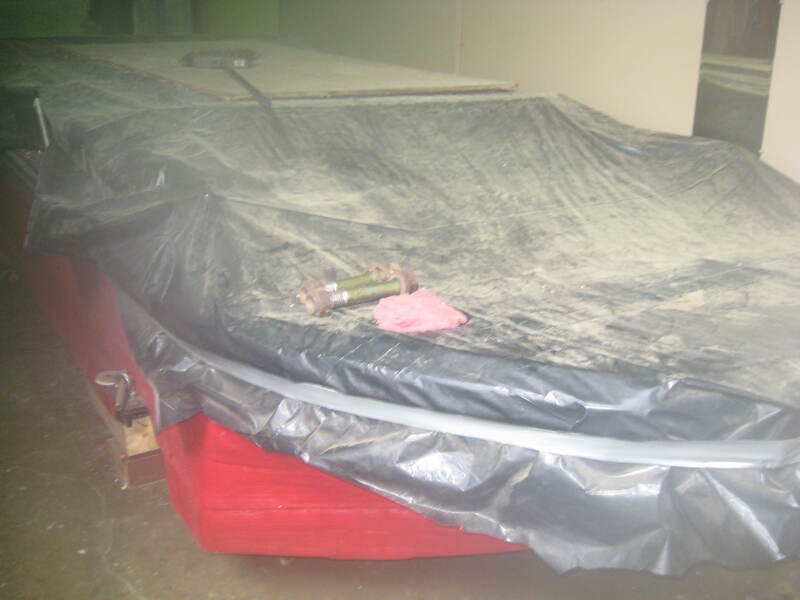 Both feature 45 degrees drop and use roller coaster track to secure the boats. 10 boats are used to navigate the 2100 feet long attraction. 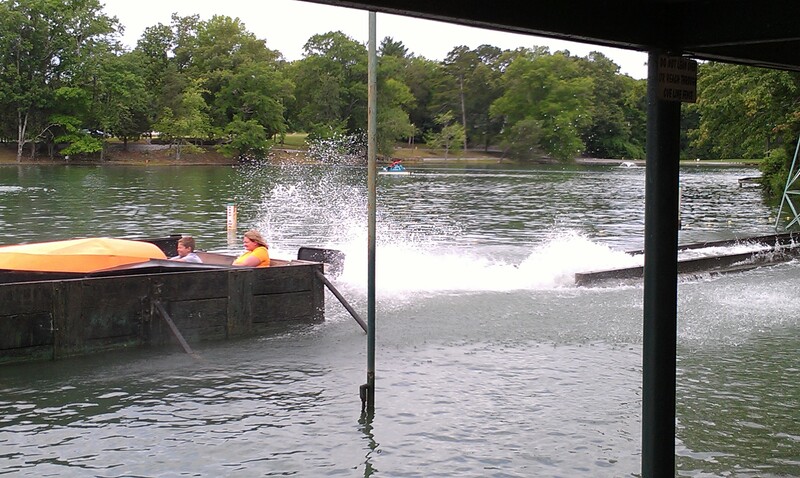 One of the ride boat after it splashed into the water. The ride final drop. Notice how both lifts share the same space, leading to the taller lift requiring custom supports. Both pictures appear courtesy of www.cedarpoint.com . Also in 2010, Etnaland in Belpasso, Sicily, Italy opened the Jungle Splash. This unique water ride starts with a short dark ride section. It then reach a tall shaft, which houses a 96 feet tall elevator lift, but use the traditional Spillwater 20 boats, not the Hyper Splash boats. This entry was posted in Water Ride and tagged Gardaland, Holiday World, Intamin AG, La Ronde, Opryland, six flags, Splash. Bookmark the permalink.